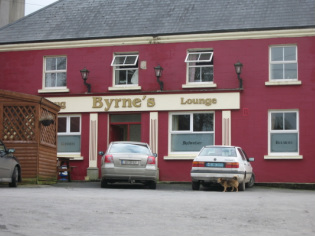 Byrne's Lounge bar in Clonmore, 2009. Crosses and other designs are cut in relief on a number of stones. They have been re-situated at one end of the cemetery. The shaft of St. Mogue's cross stands in the centre of the cemetery. The head of this cross was blown off and it is hoped to have it restored on its shaft. This is probably the spot where St. Mogue, St. Finan and St. Onchu are buried. There is one headstone with a hole in its centre where it is recorded a priest was shot as he hid behind it in 1798. Another headstone commemorates a Fr. Nicholas Doogan who was a curate in Clonmore and died on 28th September, 1767, aged 40. He was killed from his horse in a field in Knockatomcoyle. On the wall of this cemetery overlooking the road is a stone with a hollow in it, called the Chalice Stone. Tradition has it that when the present road was being made, it ran through the . site of the old monastery and its ,cemetery. This stone was built into the wall and each morning it used be on the middle of the road until finally it was placed on the top of the wall. It is thought that it was an altar stone during the time of the monastery. There is a large granite cross in The Church of Ireland grounds known as the Mission Cross. Its head and' shaft are a single piece, 7 ft. 3 ins. high and 4 ft. 3 ins. across the arms. At this spot were the ruins of a small church in 1800. A granite stone stands in a field at the south-side of the road from the Castle to the village. It is 6 ft. in length and about 33 ins. wide and is very deep in the ground; the surface of this stone is level with the ground. There are three large hollows about 12" or 13 ins. in diameter and about. 8 or 9 " in depth. Archaeoligists suggest that they were used for grinding corn in early times. It is known locally as The Bullawn stone and is also called a quem stone. Still standing are the remains of a large Castle built about the year 1180 .. According to the Chronicles of Ireland it was owned by the Crown at one time and was therefore a Royal Castle. . The Moate ( see above ) is a high conical shaped mound surrounded by a deep trench out of which it was formed. It is situated about 400 yards east of the village of Clonmore in the townland of Minvaude. There is no trace of a rampart either round the summit or base of the moate. Some Archaeologists hold the view that these moates were built by the AngleNormans on which a wooden tower was erected for defence during the building of the Castle. There is a popular tradition that an underground or escape tunnel or passage runs from the castle to this moate which is a distance of half a mile. It is logical that it was used as a signal point, as it commands a view of Mullins Hill to the east and Rathvilly moate to the west. These are just some of the interesting items to be found in this peaceful valley. It would take a couple of further articles to cover briefly all the items of attraction. Development plans are at an advanced stage at present to facilitate visitors to enjoy beautiful scenery, visit all the historical places and relax with a pleasant forest walk.